Now that Disney owns Lucasfilms, and therefore Star Wars, they have announced there will be more sequels on the way, maybe as many as three. 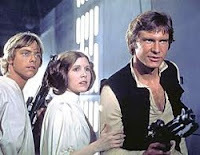 Does this mean the return of Luke Skywalker, Princess Leia and Han Solo? Well, Harrison Ford, who played Han in the first three flicks says he'd consider playing Solo again! "Harrison is open to the idea of doing the movie and he's upbeat about it, all three of them are", said a source, referring to Ford, Mark Hamill and Carrie Fisher. The first new star wars film is due in theaters in 2015. We may all laugh at the thought of old versions of the three star Wars heros, but speaking as a huge SW fan, I'd love to see what's happened to them since Return Of The Jedi came out in...are you ready? 1983! 30 years ago! Read more here.